For wow factor, fresh thinking and a family-friendly layout on a 3500kg chassis, look no further than the Sun Living S70 SP – does it live up to the hype? Sun Living, Adria’s budget brand, had been pottering along pretty nicely in recent years. Links to its Slovenian sister were strong, and not just because of the internal design – its marketing approach was similar, too. But then came the 2018 season. It was clear something was afoot when journalists were invited to a special preview, which we were told would be Sun Living only – no mention of Adria. A tantalising website was set up, giving little away except the idea that this was all going to be something radically different. When the launch of the new range came, we weren’t disappointed. 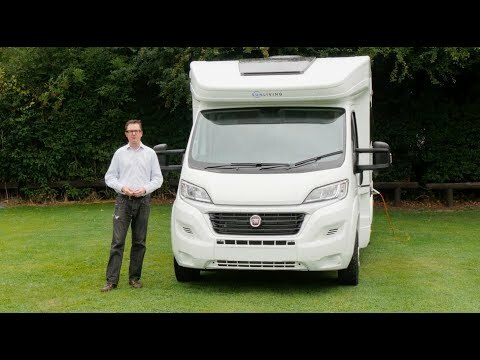 These Sun Living motorhomes were a complete departure, with new models, a new-look outside and a new interior, and remarkable innovations that included bringing one common feature of a van conversion into a coachbuilt, to save space. It wasn’t surprising, then, that the Sun Living S70 SP – one of the new-look coachbuilts – was the winner of the Best for Innovation category at our last Motorhome of the Year awards. Some months on from its illustrious win, how does the ’van – a six-berth with a rear transverse bed and a central drop-down bed – hold up? We took a tour in Essex to find out. The exterior of the old Sun Living ’vans was a mixture of silver and yellow. To our eye they looked similar to Tribute motorhomes, and it was quite easy to confuse them on the road. The colour scheme of the new Sun Living, in contrast, is radically different: bright blue and bold mid-grey. It emphasises that this is a ’van for the youthfully minded. We particularly like the Sun Living logo, with its blue – yes, blue – sun. Ever seen such a thing before? The predominantly white body is clearly there to help keep costs down. You won’t get any differently coloured cab here, although coloured front bumpers are part of an optional Comfort Pack (£1359) that also gives you a panoramic window above the cab, as our model had. In standard spec you still get scratch-resistant polyester side walls, a hail-resistant polyester roof, aluminium silver side skirting and dark edges to the double-glazed windows. The standard 130bhp engine provides a smooth ride, and you certainly don’t feel the vehicle’s nigh-on 7m length. Those who want a little more sophistication in their driving can go for the optional 150bhp upgrade, or the Driver’s Pack (costing from £1819), which includes cruise control. The cab itself is standard Fiat, with a locker in the middle rather than drinks holders – this at least allows for clearer access down the central aisle. But you do begin to realise where some costs have been cut when you notice that there is no reversing camera fitted as standard, and only one armrest to each cab seat. If you want to have manual cab air conditioning, or even a passenger airbag in your Sun Living S70 SP, you will have to go for that Driver’s Pack. In the back you get the standard two travel seats on the forward-facing bench in the dinette. The fifth seat is a rather basic, backwards-facing affair that you assemble out of the small sofa on the offside. Whoever sits there doesn’t get the benefit of a window to look out of during the journey, but they do have a head- and a footrest. If you opt to come into the ’van through the habitation door (which gets a flyscreen if you go for the Comfort Pack), there is only a rather feeble plastic handle to help you up, so you might have to hold onto whatever is dangling off the coat hooks in the door itself. The coat hooks are a useful addition, though, and there’s no window in the door for hanging garments to block. The internal headroom in the Sun Living S70 SP is an impressive 2.10m, but in the lounge itself, because of the drop-down bed, this reduces to 1.80m – tall people will need to stoop here. But when it comes to interior design, Sun Living really shows that cheap doesn’t necessarily mean unadventurous. There’s a daring colour combination of green, blue and grey, and in terms of materials, a very welcome return to corduroy fabrics. Look up at the lockers and you’ll notice one really striking change: there are no handles, just slots that you put your hands inside to open the doors. This does make for a sleeker look, and of course removes any problems you might have with handles coming off. But those who have bigger hands might need to make extra sure that they don’t get stuck! The two cab seats swivel (not having a second armrest actually helps here), so there is just about enough space for six people to sit around the main table. The offside sofa is a little removed from this, and not particularly comfortable, but there is an extension that you can fit to the table to make anyone who sits here feel more included. Even with the drop-down bed, a moderate amount of light comes in through the panoramic window – failing that, there are two LEDs under the bed itself. There are no spotlights in the lounge, but there are two in the cab that can shed light into some of the area. Two blown-air heating vents by the door provide a warm welcome, and there’s another vent under the side sofa, which will partly compensate for there being none under the table – this can be a notorious cold spot. There’s also a power socket under the side sofa, while you’ll find USB sockets both in the lounge and in the cab. We were rather surprised to find no fittings for a television within the lounge itself. While some people might regard this as a victory for civilisation and the powers of conversation, it does seem a rather daring cost saving. There are at least straps to store magazines and newspapers, and possibly even a lightweight tablet, in the door panel. Sun Living’s designers have made the most of limited space in the L-shaped kitchen by positioning the in-line three-burner hob slightly behind the square sink. This means there is workspace, lit by a striplight, right where you need it in front of the hob. There’s also a power socket under the sink, which could be used either by the chef or by someone in the lounge. The two lockers up top are spacious, but again have those slot ‘handles’. Underneath the worktop there are two drawers (one large, one small) next to a Thetford Duplex oven. Another cupboard under this has a bottle rack and gives access to the gas taps. To the left of the main kitchen area is a huge, 142-litre fridge. Next to this is a large cupboard, with shelves that you could use for food, clothes or both. But what you really notice standing here is the extra feeling of space you get from what the designers have done in the washroom. At 1.35m wide, the ’van’s transverse rear bed is a little on the narrow side to be the main bed. But it is comfy and well lit by a rooflight in daytime, or two spotlights (one of which is directional) at night. There’s also a small pocket for magazines, and a mains socket, but no USB. You are helped up to the bed by a ladder that sits in front of the internal door to the garage. The drop-down bed is a better size (for a drop-down bed) and is also comfortable. There’s a useful spotlight for night-time reading, but pulling the bed down does partially obstruct the habitation door. It must be difficult to avoid this kind of eventuality in designing this size of motorhome. Additional beds that you make out of a combination of tables and seats in a front dinette are rarely ideal. But the one in here, which you also put together with the table extension, is easier to assemble than most. However, it’s only 95cm wide, so as a double, it’s really only for small children. The Sun Living S70 SP’s washroom – which also features on other Sun Living coachbuilts – is where the brand’s innovation really shines. And all through the simple inclusion of a tambour door that you can slide away to create space when the washroom isn’t in use. This is quite a common feature in van conversions, but within the extra space of a coachbuilt, rolling the door away really pays dividends. It’s not even as though the washroom itself is tiny. In fact, with the tambour door extended there is plenty of room inside, and headroom is exceptional. The handbasin tap may double as the showerhead, but you still get two drain holes in the shower tray and a roof light – not something you always see in an entry-level ’van. There’s a mirrored cupboard with shelving, two LED lights and corded shelving by the door. Is there a downside? Yes. Obviously there’s a rail in the floor that your toes have to contend with. The shower curtain also covers all of the washroom unit when you’re using the shower, but doesn’t really shield the door, so you may have a wet wall to contend with if you immediately roll the door back afterwards. These are minor points, however. Storage is another plus point, because there’s loads of it. The huge garage, with doors at either end, is easily big enough for bicycles to stand upright, and much more besides. This area is heated, but not lit and, unusually, the gas bottle locker is located inside here. This is great for security, but if you want to carry two gas bottles with you, there’s only room for a pair of 6kg ones. This garage can also be accessed from the inside, through a huge door under the transverse bed that’s big enough for a small child to climb through. A thin cloth attaches with Velcro to shut away this access on the garage side. There are three large overhead lockers in the rear bedroom, to complement a sizeable cupboard. Even with that huge cupboard between the kitchen and bedroom, you still also get a full-height wardrobe. In the front, the space under the side sofa is clear, although the room under the travel seats is mostly taken up with electrics. There are two lockers over the front dinette, plus two shelves either side of the cab. All told, the equipment included in the 2018 Sun Living S70 SP is at the ample end of what you would expect to find in an entry-level model. A Duplex oven is fitted as standard, as is the insulated and heated waste-water tank. Heating is by Truma’s Combi 4 system, although Combi 4E (which gives greater flexibility in terms of heating options) is included in the Comfort Pack. The 142-litre fridge is a substantial size for any type of ’van. The only anomaly here is the lack of provision for a TV, but perhaps Sun Living, in keeping with more recent developments in modern life, thinks its target youth market will have means of gaining reception other than via a standard aerial. Sun Living has really transformed itself into a brand that can stand on its own in 2018, and these new designs are some of the most exciting we have seen this season. We particularly love the ‘hideaway’ washroom. You get a relatively high spec level for a motorhome that costs less than £50,000, too – whether you choose to forgo the optional packs or keep them, it remains a competitive price tag. Some may not like the very modern interior design, while the layout of this Sun Living S70 SP (with the drop-down bed partially blocking the habitation door) shows that six people are a lot to fit into a space measuring less than 7m. But we think this impressive range will be here for a good while.